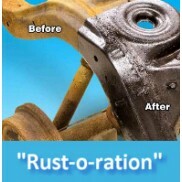 RUSTYCO ® RUST-dissolvent is a unique rust remover. It removes rust from all nooks, crannies and seams from (stainless) steel, aluminium and most ferro metals without bead blasting or sanding. It is NOT a transforming agent. It cleans the surface and acts as a rust deterent. Ideal base for all primers and paint systems. RUSTYCO is a concentrated product. to be dissolved in water. ONE liter RUSTYCO is enough for 20 liters dissolvent. This solution can be used repeatedly untill the solvent turns black/dark. RUSTYCO does not harm the base material, nor does it affect paint, plastics, wood, rubber, vinyl, glass, Copper, or Chrome. No toxic fumes, not poisenous, non flamable, biologicly degradable, invironmentaly safe. DIRECTIONS FOR USE: Remove all excess rust, dirt and grease. Dissolve Rustyco in water. (Use a bucket or container) Use 5 caps op Rustyco in ONE liter water for light corrosion to pure product for heavy rust. Leave the rusted part in the solution for at least 30 minutes. Approx. 72 hours can be necessary for heavyly rusted parts. Take the part out of the fluid repeatedly to brush the loose rust and rinse with water. This speeds up the cleaning process. By heating up the solution, the derusting process will be accelerated. After completing the process, the clean part can be protected against corrosion by leaving it in the solution for another 5 minutes, leave it to dry. Objects too large to be submersed or objects that cannot be dismantled can be treated with RUSTYCO GEL. Rustyco Roest verwijderaar 250 ml. Roest verwijderen en ontroesten doe je met Rustyco ontroester In onderstaande video kunt..
Rustyco Roest verwijderaar 500 ml. Rustyco Roest Verwijderaar 1000 ml. Roest verwijderen en ontroesten doe je met Rustyco ontroester In onderstaande video kunt u z..